When developing a new recipe I like to walk through the farmer’s market and see what is in season, or sometimes I consult the Union Square Greenmarket app, which tells me what is going to be available with photographs and all. I seriously love this app! This is exactly what I did when developing this recipe. I couldn’t help but fall in love with the beautiful variety of eggplants, from fairy tale eggplants in all shapes and colours, to small round Indian and Thai eggplants. When I spotted perfectly plump figs I knew exactly what I was making, a Middle Eastern influenced eggplant and fig dish. Seriously, walking through the farmer’s market can be inspiring and will lead you to pair produce you may not have. Cooking is all about being creative. I absolutely love this recipe because it’s stress-free to prepare as most of it goes into the oven to be roasted. If you can’t find fairy tale, Indian, or Thai eggplants don’t fret. You can use conventional sized Italian or Japanese eggplants. You can cut Italian eggplants into ½ inch rings, slicing large rounds into half moons. With Japanese eggplant you can slice in half vertically and then into 3-4 inch pieces. You will fall in love with the miso tahini dressing, which I ever so slightly tweaked from The Kitchn. It’s freaking delicious and you will probably want to bathe in it….or make a large batch and pour over all your dishes. For the cilantro haters, parsley or mint will work wonderfully in it’s place. Please let me know if you make this dish. I would love to hear your thoughts! Preheat the oven to 400° F. Place the eggplants and figs on one baking tray with 2 tbsp olive oil and 1 tsp salt. Place the chickpeas on another baking tray with 2 tsp olive oil and 1 tsp salt. Roast for 25-30 minutes or until eggplants are soft tender and chickpeas are golden and crisp. Meanwhile, prepare the miso tahini. Whisk together all of the ingredients except for water. Whisk in warm water just until sauce has thinned out. 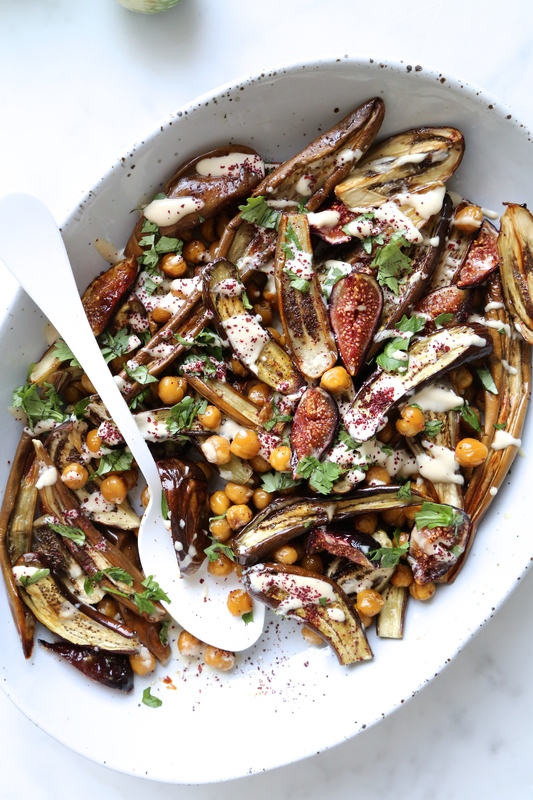 Combine the eggplants, chickpeas, and figs on a serving dish. Drizzle with dressing and garnish cilantro and sumac. Enjoy immediately. This entry was posted in Starters/Sides and tagged healthy, mediterranean, plant food, plant-based, tahini, Vegan, Vegetarian, wellness. Bookmark the permalink.